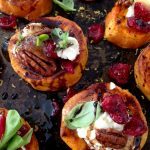 This easy goat cheese appetizer recipe is guaranteed to be a hit with everyone, and steal the show at your next summer BBQ! 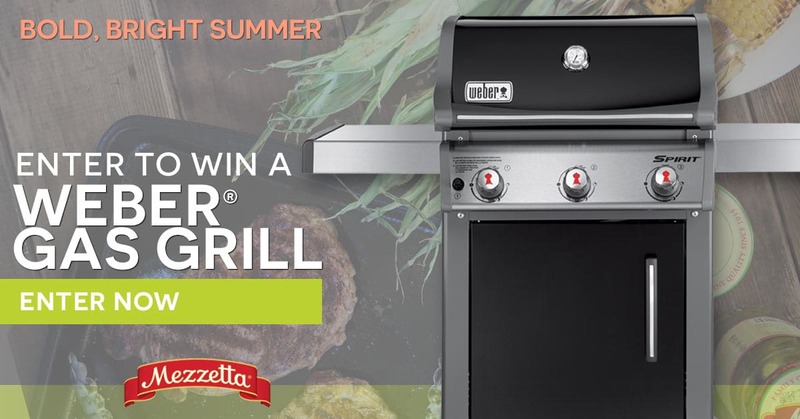 Are we all ready for summer and BBQ season ? Let me tell you from experience that it gets pretty hot around the grill, especially when you are grilling in the heat of Southern California. Which is the reason why I always wait to crank up the grill until the sun starts going down. But meanwhile we still need to eat. 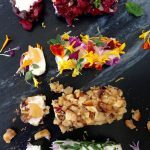 So I have the perfect cool and easy goat cheese appetizer recipe to carry you trough the hot days. 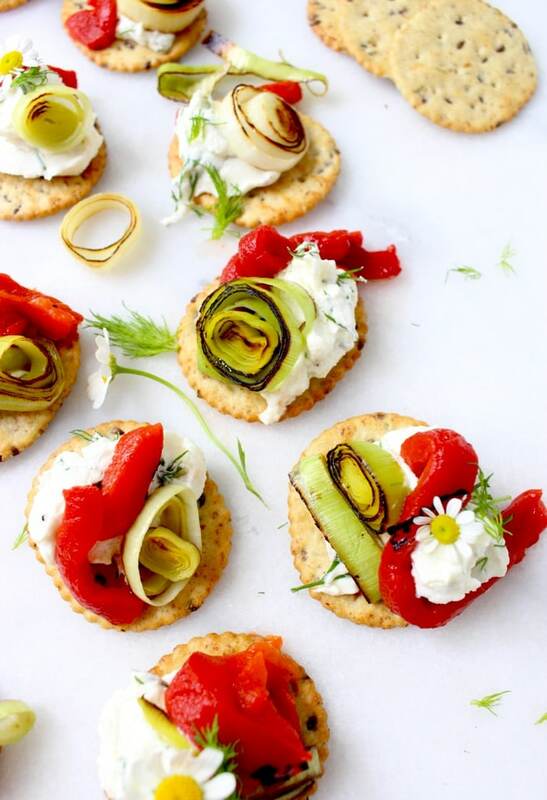 One bite, no mess cheesy delicious flavor loaded appetizers with whipped goat cheese, caramelized leeks and flavorful roasted bell pepper strips. How can anyone resist ?! 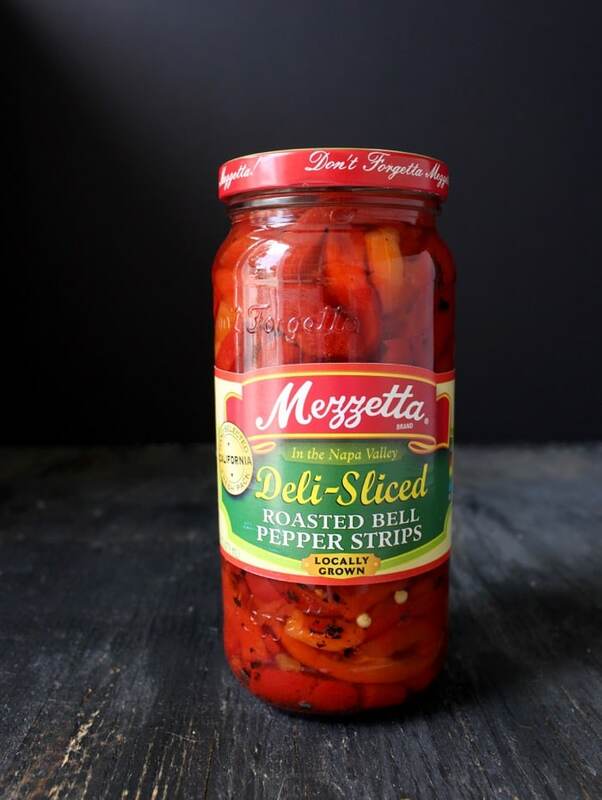 All you need to do is stock up on your favorite crackers, a couple of jars of Mezzetta roasted bell pepper strips and some good creamy goat cheese. Just before you are ready to assemble your appetizers, quickly rinse and dry a large leek, slice it into rounds to caramelize in less than a minute in your cast iron skillet. Just enough to bring out its sweetness and catch a little smoky flavor. Perfect served at room temperature but you could definitely make the leeks in advance and refrigerate them for later. Now, If you are looking to do a super intense leek caramelization, the kind that’s cooked slow and low for an hour, then I would suggest you prepare that in advance just like we do with these caramelized onions. But why would you want to do that? This is a summer appetizer loaded with fresh flavors and textures, plus who wants to be stirring the pot in 100 degree weather? Nobody I know! 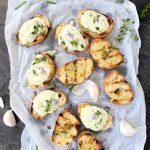 Cool appetizers on a hot summer day are hard to beat, and all the flavors happening in my goat cheese appetizer recipe are absolutely to die for! I almost called them Goddess Goat Cheese appetizers, but i didn’t want the men to assume they might not like them. Because trust me, your man guests will be all over your Goddess appetizer platter. How do you feel about fresh dill ? Because my goat cheese appetizer recipe asks for dill, it really belongs in here. However, I do know that not everyone is fond of dill. I used to hate it as a kid, and now I can’t get enough. If you are still at that stage in your life, then you’ll just need to replace it with some thyme or chives, or leave it out completely. Eventually you’ll learn to love dill, eventually! If making this goat cheese appetizer recipe in advance, just remember to keep everything separate in the fridge. 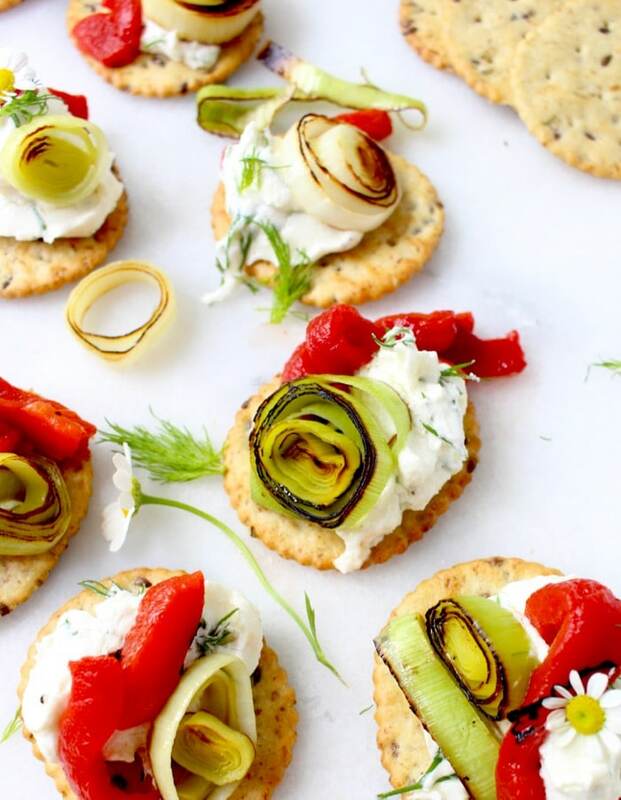 Assemble them just before you are ready to serve or the crackers will get soggy from all the toppings, and believe me, nobody wants a soggy appetizer. You want perfectly crispy bottoms topped with creamy goat cheese, and flavorful leeks and roasted peppers and fresh herbs! Add the goat cheese and 1 tablespoon of olive oil to the bowl of a mini food processor. Pulse together for about a minute or so until smooth. Transfer to a bowl and stir in a pinch of sea salt and the fresh dill. Refrigerate until needed. Rinse the leek very well under running water and dry on paper towels. Cut the white part only and slice it into about rounds. You will need about 15 to 20 rounds to divide between the crackers. Preheat a cast iron skillet on medium high flame. Add a lug of olive oil, just enough to coat the bottom of the skillet. Carefully place each of the leek rounds on the hot skillet without touching each other. Sear until caramelized on both side. About 30 seconds or so on each side. Using a small spatula transfer them to a plate and sprinkle with a tiny pinch of sea salt. 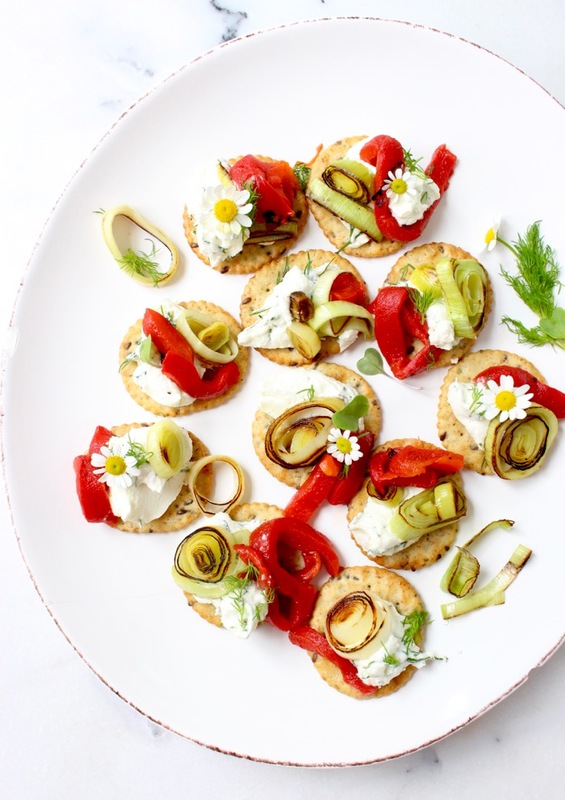 Arrange the crackers on a serving plate or cheese board and top each one with a dollop of the whipped goat cheese. 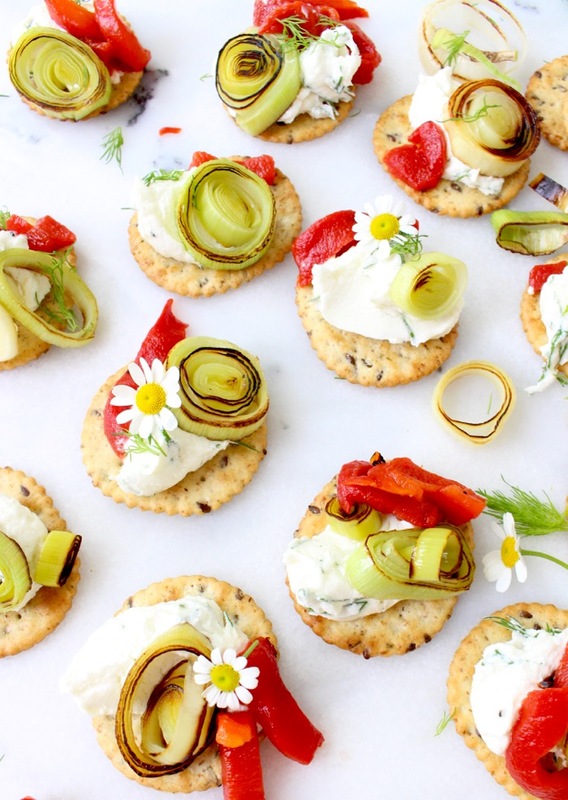 Place one of the caramelized leek rounds on top of the goat cheese and top with some of the roasted red peppers. 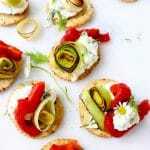 Garnish your goat cheese appetizers with fresh dill or edible flowers if available. Wow, those look SO GOOD!!! 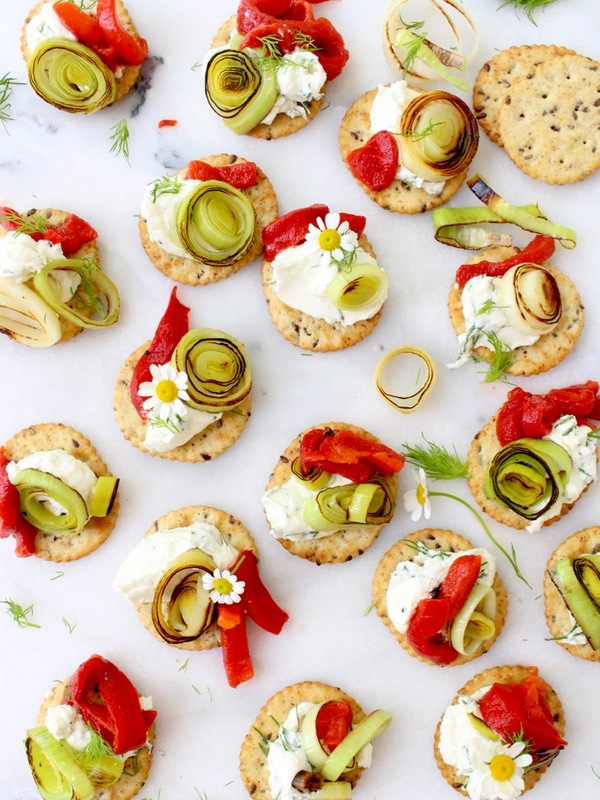 What a pretty and fun appetizer!